This set is so cute and so me. I often drink tea for my throat or just because, mainly the latter. I enjoy tea very much, I think it comes from my British side. Just seeing this made me giggle with glee. From the size to the pure awesomeness of it. You get your tea pot, infuser, and cup all in one little package. Great for gift giving for sure. My favorite part besides its looks is the interchangeable handles. You can change up the little silicone handles between, yellow, red, and blue. You can match your decor, outfit, or attitude, the choice is yours. Since this is stainless steel it is easy to use and care for. I am loving my Teapot and cup for one. 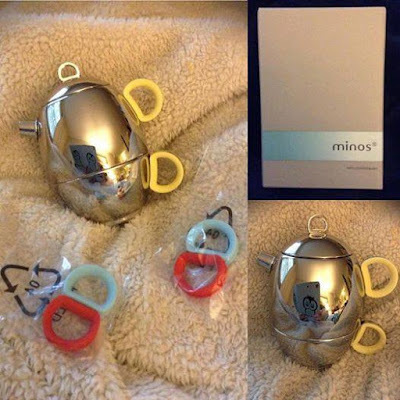 The Minos Teapot and Cup for one can be found on my affiliate link below. Disclosure: MarksvilleandMe received one or more of the products mentioned above as part of a promotion with Tomoson and Minos. Regardless, MarksvilleandMe only recommends products or services we use personally and believe will be good for our readers. Some of the links in the article may be “affiliate links.” This means if you click on the link and purchase the item, I will receive compensation. If you would like MarksvilleandMe to review a product or service please contact us at marksvilleandme@gmail.com.